Mijnwater has today been announced as the winner of the European Geothermal Innovation Award 2015 at GeoTHERM, Offenbourg. The three other finalists were Comacchio s.r.l., Gec-co GmbH, and Green Energy Group SA. Designed as an opportunity for industry peers to acknowledge innovation, and for the most exciting ideas to be widely publicised, the European Geothermal Innovation Award is the seal of excellence applied to the most intelligent and important ideas in research and industry which will play a key role in the future development of geothermal energy. Nominations for the award are assessed on grounds of originality, innovation, reliability, reduction of emissions, and improvements in energy output. When asked what made the MijnWater project special, the team collecting the award explained that it was the project’s unique approach. “We use the geothermal energy as both a source and for storage. We look at all aspects in an effective comprehensive way, considering technical potential, the network, integration in the built environment, and public acceptance. The demand side of connections is central to our strategy- it is the starting point.” They added that “The successful exploitation of geothermal projects is based on a demand side approach with a mixed and smart supply of renewable energy”. The jury for 2015 is composed of Jonas Ketilsson (Iceland), Adele Manzella (Italy), Ladislaus Rybach (Switzerland), Burkhard Sanner (EGEC), and Sandra Kircher (Messe Offenburg). 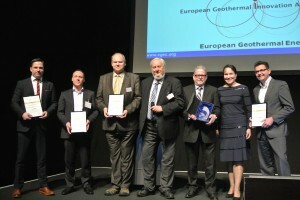 The European Geothermal Innovation Award 2015 is an initiative from the European Geothermal Energy Council in collaboration with Messe Offenburg, organisers of the GeoTHERM fair and congress.